I recently touched base with Australian road & track cyclist Nettie Edmondson who is firmly focused on track cycling gold in Rio. I had the pleasure of meeting Nettie for the first time about four years ago and soon after wrote my first post about her. 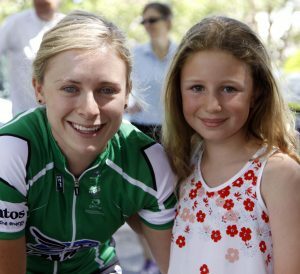 By coincidence one my friend’s daughters Keira, who is a keen track & road cyclist herself, is a huge fan of Nettie’s. So last year when we all visited Adelaide for the Tour Down Under I arranged for us to meet up with Nettie. Keira is pictured here with her hero. I was really touched by how willing Nettie was to meet her young fans. She took the time out when she was warming up for a race to have a quick chat and photograph. Nettie’s got a big year ahead of her so I wasn’t surprised by the single-minded answer to question one. I also took the opportunity to ask her a few more questions which she very kindly answered via email from her current base in Adelaide. Q: What’s your main focus for 2016? Q: You switched to the Wiggle Hi5 women’s from last year. How are you enjoying that team? It’s great. I needed a change as things were starting to get a bit stale. Orica AIS were brilliant for my first few years on the road. I learnt so much from my teammates and the staff- it was the perfect, comfortable environment for me to start in. The majority of the team was Australian, so it felt a bit like home whilst I was away, tackling my first two years of the craziness experienced in life “on the road”. But there comes a time when you need to step outside of your comfort zone in order to grow, so when WiggleHigh5 approached me to be part of their heavily multicultural and diverse team, I grabbed at the opportunity. 2-time road world champion, Giorgia Bronzini offering her guidance in road sprinting was also a major drawcard. Q: I enjoyed meeting up with you last year in Adelaide at the Tour Down Under. How important is it to you to interact with cycling fans? It’s really important! I get so inspired by the opportunity of meeting my idols, by realising they are real people. It makes me realise that goals and dreams can come true. If they can for my idols, they also can for me, provided I work hard enough for them. That’s why I feel it’s so important to take the time to try and ignite the fire in some of my fans, whilst also giving back to those who have made the effort to come out and support me over the years. After all, support makes all the difference, picking you up through the hard times and pushing you to new levels, whilst on course. Q: Last time we featured you in Women Who Cycle three years ago you said you were studying at Uni. How’s that progressing? Is it hard to balance cycling and study? The study has been put on hold. I deferred soon after I spoke to you and haven’t looked back. My lifestyle is so intense that I really do look for the downtime to keep me balanced. Some people are able to juggle both, and I completely admire them for it, but at this stage in my life, my sport is enough. If I knew exactly what I wanted to do post cycling, I’m sure the study would be easier and more enjoyable, but I haven’t come to that conclusion yet! Q: Which do you prefer – road or track? Q: Do you have a mentor who works with you to help develop your career? Not a particular person, but I take guidance from a range of close friends and family. My parents, my coaches, Gary Sutton and Tim Decker and family friends like Barry Skinner are a few of my major influences. Q: What do you think we can all do to encourage more women to ride bikes in all forms? Hold more events, hold more ‘come ‘n’ try’s’, hold more races, boost the profile in the media, athletes or people of significance using their social media channels to promote involvement. Good luck Nettie. We hope you reach your dream of track cycling Gold in Rio. We’ll be watching from down under.